找不同 Kid is required to look for differences between two pages. 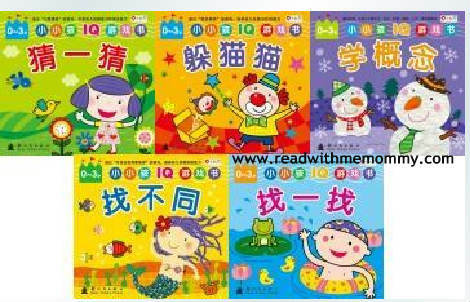 学概念 Kid will learn about more (多) vs less (少), tall (高) vs short (矮), etc. 猜一猜 A few hints will be given and the kid is required to guess the item. Reveal the answer under the lift-up flap. 躲猫猫 One item can be found on the bottom right hand side of the page and the kid is required to locate this item on next page. 找一找 Activity is similar to 躲猫猫.